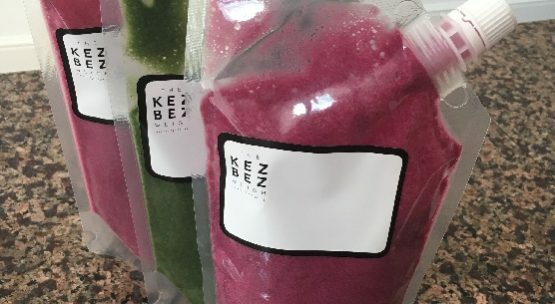 THE NEW KEZBEZ WEIGH SUPER SMOOTHIES ARE COMING! So you’ve heard about my Tropical smoothie, but have your heard about my Peach Punch smoothie? Peach, green tea, spinach, fresh ginger, goji berries, chia seeds and whey protein powder. All carefully selected for their great taste and health benefits. Peaches are sweet and packed with health promoting anti oxidants, fibre, vitamins, minerals such as potassium & iron. Not to mention flavonoids – these compounds act as protective scavengers against free radicals – which cause disease and premature aging. Then we have green tea, known for its anti oxidant properties. Spinach has a good amount of iron and other minerals & vitamins. Eaten regularly, spinach can help prevent iron deficiency anaemia and provide protection from some cancers & cardio vascular disease. Goji berries have flavonoids in abundance that act as anti inflammatory, anti oxidants and anti cancer agents. Fresh ginger, another fabulous ingredient. Studies have shown ginger helps to reduce nausea caused by motion sickness and pregnancy and could be helpful in the relief of migraines. Chia seeds are a great source of omega-3 fatty acid, ALA. This fatty acid has anti-inflammatory properties that can help lower blood pressure, lessen coronary artery disease, reduce the risk of stroke, and some cancers. Of course, it also includes a serving of easily digested protein to aid growth & repair of muscle tissue, after the punishment David & the guys like to put us through! Essentially, you’ve got a health promoting meal in a pouch to grab and go or sit and sip! We all know we need to try to fill up on fresh wholefoods like fruit & vegetables. My smoothies take away some of that effort and make it easy to achieve. No preservatives, no additives. Just fresh ingredients carefully selected for your enjoyment. Each Peach Punch smoothie will give you 25.8g of protein, 17.6g of carbohydrate, 4.9g of fat and 4.1g of fibre. All wrapped up in a mere 224Kcal. IN SUMMARY, YOU’D BE MAD NOT TO TRY IT! AVAILABLE FROM ELEMENTAL KICKBOXING ACADEMY FROM SEPTEMBER.